Hybrid and electric vehicles will be required to emit an audible warning at low speeds, following a new federal safety standard set in the United States. 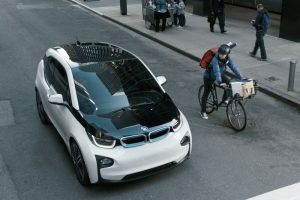 Announced by the National Highway Transport Safety Administration (NHTSA), the rules apply to electrically-driven four-wheeled vehicles weighing 10,000lbs (4.5 tonnes) or less, all of which will now have to make a noise when travelling at 19mph or less to warn pedestrians they are approaching. Originally proposed in 2011, NHTSA said this will help prevent 2,400 pedestrian injuries once all vehicles are equipped. Manufacturers have been given a 1st September 2019 deadline to meet the new standard, though half of new hybrid and electric vehicles must comply one year beforehand.